It’s the second-leading commodity traded in the world after oil, with a worldwide consumption of 2.2 billion cups per day. And, the United States is its leading consumer at 400 million cups daily. Yet, few people are aware of the scientific, political, historical and cultural implications swirling inside their cup of morning joe. This is not the case for Hope students who take Dr. Tom Bultman’s new class, The Science and Culture of Coffee. They are getting a thoroughly flavorful education about everything they ever needed or wanted to know about coffee. True scientific experiments are conducted using coffee as the vehicle to construct hypotheses, make predictions, collect data and evaluate outcomes. 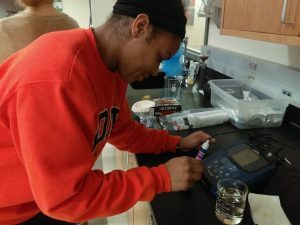 Angelique Gaddy measures the acidity of coffee using a pH meter. Offered for the first time this spring, Bultman’s two-credit coffee course is just one of two of its kind taught at colleges and universities in the U.S. as far as he can tell (the other is offered at UC-Davis). While there are dozens of barista schools in the country that teach their students how to roast, grind and brew the perfect cup of coffee, this new class for college credit goes much deeper than that. True scientific experiments are conducted using coffee as the vehicle to construct hypotheses, make predictions, collect data and evaluate outcomes. How do acidity levels change in beans due to varying roasting times? What happens to the mass transfer of water and grounds during the brewing process? What is the anatomy of a coffee cherry fruit and how are beans harvested from within? There are history lessons, too, about the global trade of the Coffea arabica beans and bush — a plant native to Ethiopia that helped create early agricultural routes throughout the sub-tropical world. Bultman, a professor of biology, also covers ground on the way coffee affects national economies, personal health and policies on fair trade and human rights. And knowing how much college students love their coffee for its social and caffeinated benefits, Bultman’s course is listed under Hope’s General Education Math and Science offerings which target non-science majors. It’s gives its pupils one truly eye-opening experience. From left to right. Sarah Lundy, Kirsten Kettler, and Savanah Stewart roast green coffee beans using a air popcorn popper, tin can, cooking thermometer, and iPhone timers. Coffee chaff from the roasting surrounds the popper. 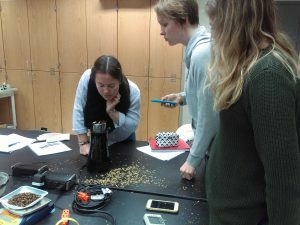 Students in the class roast green coffee beans nine times during its half-semester schedule, using makeshift roasters that consist of an air popcorn popper, a tin can, and a small cooking thermometer. 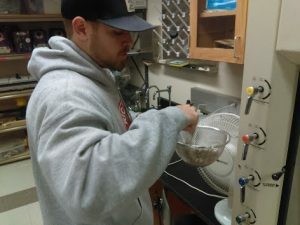 As the chaff from the beans pops like confetti from the contraptions’ tops during the roasting process, the lab becomes the best smelling classroom on campus. Students monitor the time, temperature, color and odor of the beans. Then later, they’ll brew and drink their roasted creations, experiencing the process of “cupping” to learn to how to discern and evaluate the taste of flavor notes — chocolate, butterscotch, molasses, raisin, for example — that are subtle but evident in good beans. Gerrit Immink cools his beans. As if getting free morning coffee isn’t benefit enough (the course is offered at 9:30 am on Tuesday and Thursdays), Bultman even sets aside a class period for his students to learn how to create their own coffee mug in Hope’s ceramics studio under the guest tutelage of art professor Billy Mayer. Field trips to area businesses that roast and retail are also on the course syllabus. Not surprisingly, this class on coffee has grown in popularity quickly. It’s been full to the brim each time it’s been offered (twice thus far) and the buzz around campus is that more students are clamoring to get in.